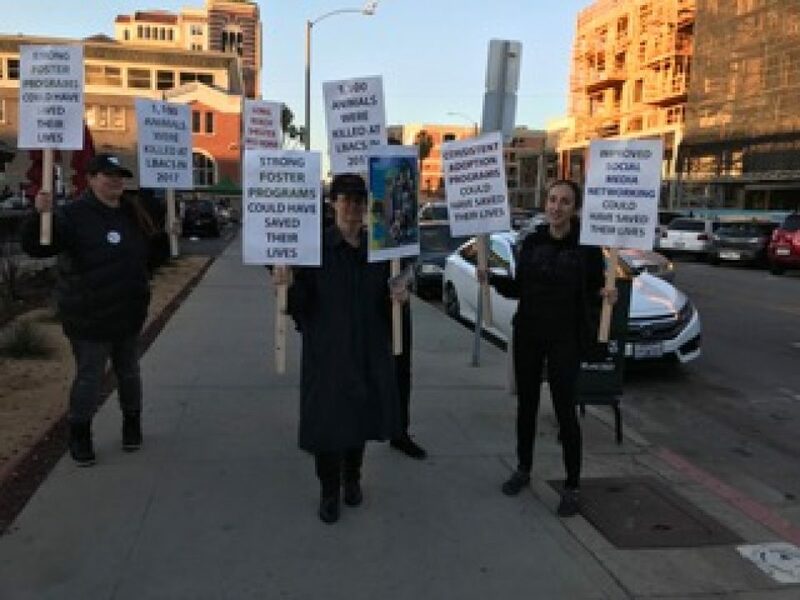 If you attended the People’s State of the City 2018 on March 1, you probably saw a coterie of people dressed in black and holding signs, lining the front of the First Congregational Church on Third Street and Cedar Avenue. They were members of Long Beach Animal Advocates (LBAA), a months-old organization of Long Beach-area residents who are pushing hard and audibly for a no-kill community in Long Beach, and they were a vigil for adoptable pets that annually die in shelters, particularly at Long Beach Animal Care Services (ACS). 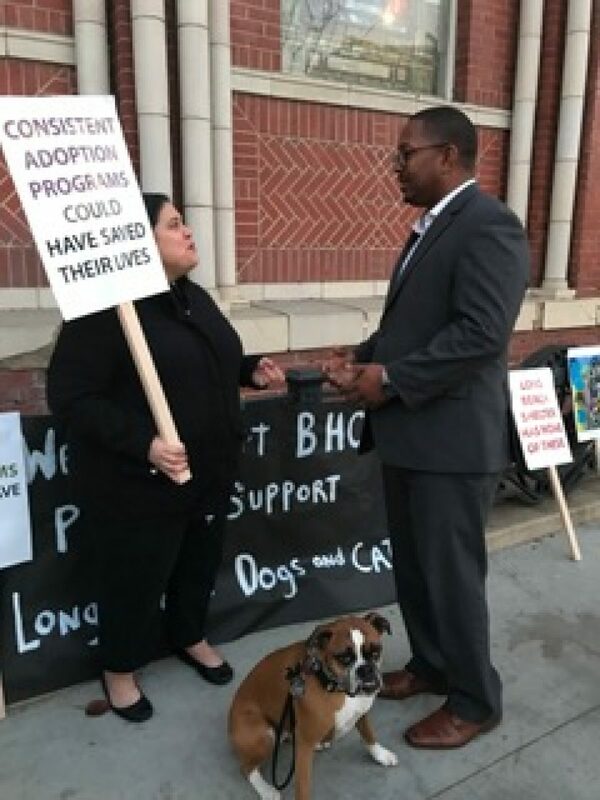 The signs spelled out several needs that group members feel must be fulfilled in order to create a no-kill city—they included flexible hours at the shelter, better signage for the public, a consistent adoption program and a strong foster program. 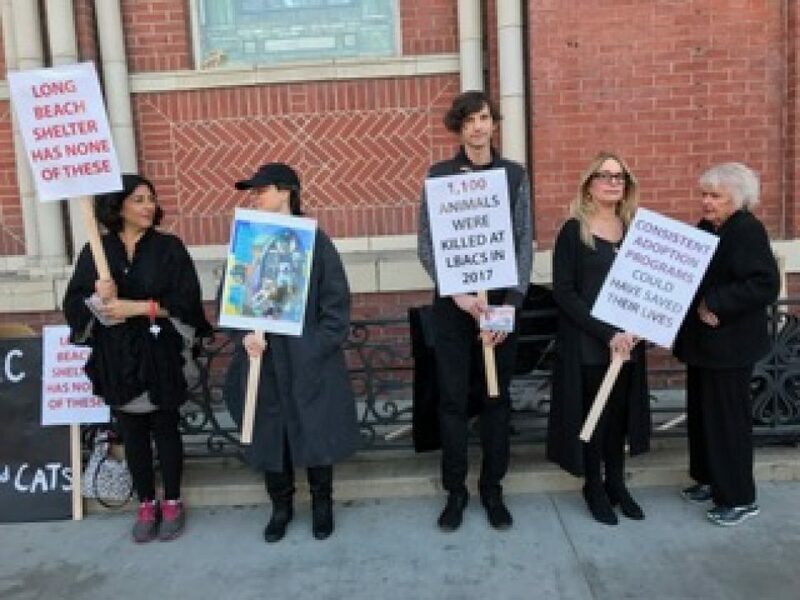 “We hope to create awareness within the community about what’s happening at our local shelters and that their efforts are needed to get involved,” said LBAA member Candace Lawrence, who organized the vigil. LBAA advocates line the front of the church and march down Cedar Avenue with their signs. Founder Emily Ann Ghosh is in the lower photo on right. All photos by Kate Karp except where noted otherwise. The Long Beach area likely has more animal advocates and services per square mile than there are sliders at a Super Bowl party. There are rescues and fosters and community-cat trap/spay-neuter-return efforts. There are free spay/neuter procedures and low-cost-vaccine clinics. There are numerous dog parks and one dog beach, pet boutiques, pet-supply stores, groomers and veterinarians. There’s a shelter whose staff grapples with limited resources as they struggle to adopt out every pet housed there. A group of local residents who are committed to making themselves seen and their voices heard is an effective way to bring the needs to public attention and make things happen. Local and national news bear that out. LBAA member Nadith Werth discusses the goals of the organization with Long Beach Vice Mayor Rex Richardson. No-kill is described by national pet-welfare organization Best Friends as no animal being subject to euthanasia “except in cases of terminal and painful illness, when compassion demands euthanasia because there is no reasonable alternative.” Not all Long Beach animal advocates at large agree with every tactic of LBAA or have time to participate, but every one of them—volunteers, shelter employees, rescuers and your generic animal lover (if there is such a thing)—desires happy outcomes for all animals, and most of them would agree with the no-kill philosophy although not always with one another regarding details. Putting a healthy pet to sleep because there’s no room at the inn is heartbreaking. No-kill is a big order, though. It’s not going to happen overnight, but LBAA is turbocharged with determination to get it going maybe the day after tomorrow. The group meets every other week to strategize and come up with ideas for actively growing no-kill in the shelter. They organize events, such as the March 1 vigil, to call for community awareness. Members have come in force to city council and city budget meetings wearing white shirts and bearing placards to speak up for resources to strengthen adoption programs and to increase no-cost or low-cost spay/neuter. They implore city officials and shelter management to implement a foster program at ACS that’s distinct from the one at spcaLA, a privately funded shelter that shares the P. D. Pitchford Companion Animal Village with ACS and has a unique partnership with it. LBAA’s members state their messages through signage. Photo courtesy of LBAA. The crux of shelter and rescue overcrowding is attributable, and not so arguably, to the number of unaltered cats and dogs who produce unwanted offspring. LBAA members note a gap in the availability of free and low-cost spay/neuter programs, a necessity in mitigating shelter intake. Lawrence noted that although Fix Long Beach, FOLBA and low-cost clinics like the Spay/Neuter Project of Los Angeles (SNP/LA) offer invaluable services and do benefit from the shelter’s voucher program, it’s still not enough to cover a huge need that remains in the community. ACS’s vouchers take a bite out of spay/neuter-procedure cost and sometimes a pretty healthy one, but Lawrence pointed out that the co-payments at many but not all of the participating veterinaries could still be in the hundreds and thereby not as accessible to many people. Furthermore, the SNP/LA clinic located in Pico Rivera will be moving to a bigger location in South L.A.—a good move for the organization but another half-hour’s drive from Long Beach. The remaining clinic in San Pedro would take on a bigger burden in the Long Beach area. “I’m trying not to panic—I’ve already got 10 community cats in the queue [at the San Pedro facility],” said Kelly Lopes of neighborhood rescue group Wrigley Kittens. Lopes and other members are anticipating the onset of kitten season, which may sound adorable but is actually a period of time lasting roughly from spring to autumn. It can stretch a few weeks in either direction in warmer climates, and it fills shelters with kittens and mother cats. “Long Beach Animal Advocates would like to push for a cohesive program at the Long Beach shelter to manage spay/neuter,” Ghosh said. “It shouldn’t be just up to Fix [Long Beach], it shouldn’t be just up to vouchers. The shelter’s beautiful new facility should be open to the public once a month.” Ghosh added that bottle-feeding programs, enforcement of mandatory spay/neuter and the aforementioned shelter foster program would decrease the intake and increase the positive outcomes of shelter pets. 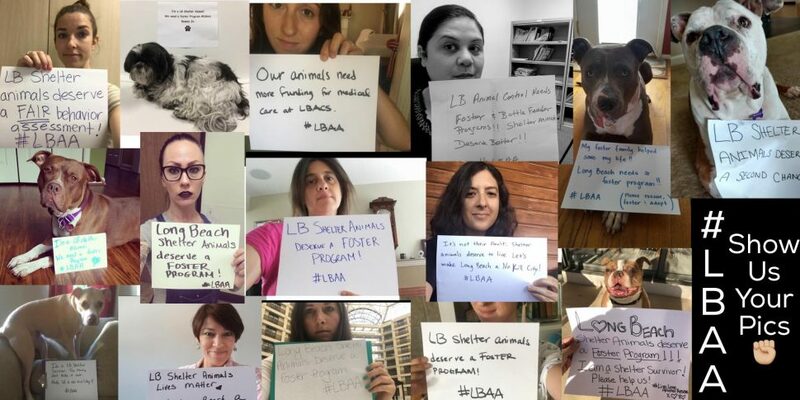 Despite the tone of outrage implicit in the signs, Ghosh was quick to point out that LBAA isn’t placing blame on the shelter. Several LBAA members attended ACS’s Open House on February 12 and spoke with ACS manager Ted Stevens after the meeting. Stevens responded to concerns about the fate of the non-dogs and cats (bunnies get adopted or pulled by rescues; reptiles get sent to specialized rescues or other organizations); the desire to see the live-release rate, which comprises adoption, owner return and rescue pull, continue to increase; the fate of pets with ringworm and other conditions (there’s a special room to treat ringworm cats; they’re no longer subject to euthanasia); a wish for a distinct foster program (the shelter never had one when it was animal control); making the shelter’s web page more accessible (Stevens was in the process of interviewing candidates for a full-time marketing position, and improving the page is one of the targets); and the possibility of doing the procedures at ACS’s new medical facility and increasing low-cost options. Stevens said that the ACS clinic does all the spay/neuter surgeries for the community cats brought in to the shelter and that the medical staff has its literal hands full with sick and injured pets. Stevens did say that he’d reach out to local vets who might help with providing low-cost procedures and that he’d contact the city’s health department to see if any veterinary personnel involved in disease surveillance can help with this. He promised to see whether he could increase availability of spay/neuter procedures to the community at large. He suggested that a mobile clinic such as Spay-4-LA, which does the procedures for Fix Long Beach, might be engaged once a month. The group asked Stevens if he’d be willing to attend one of their meetings; he responded affirmatively and asked to be informed of meeting dates. Yes, a big order, but LBAA is intent on trying to fill it. Follow LBAA on Facebook through this link. If you’re interested in becoming part of the effort, watch for the next meeting.